Attorney Vito Manicioto Chosen as an Elite Attorney | Hupy and Abraham, S.C. Personal injury law firm Hupy and Abraham, S.C. has announced that Attorney Vito Manicioto has received honors from the Elite Lawyers of America. In addition to this award, he has been named a Top 100 Trial Lawyer by the National Trial Lawyers Association and a Top 40 Under 40 Litigation Lawyer. 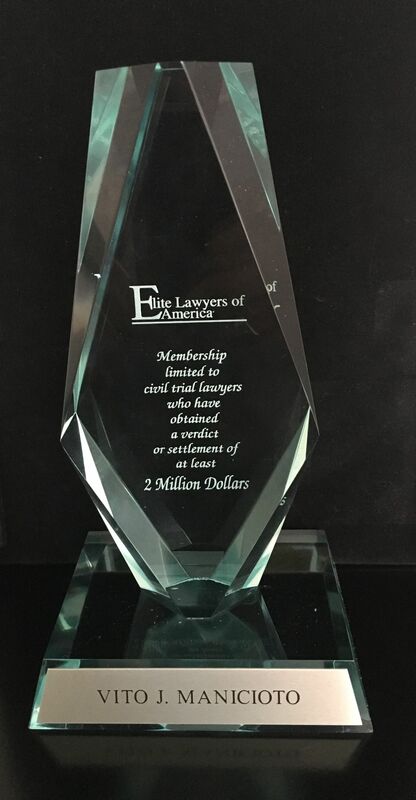 The Elite Lawyers of America recognizes the outstanding achievements of a select group of lawyers who have obtained a verdict or settlement of $2 million or more in a civil case. Attorney Manicioto is a member of this small percentage of attorneys who have been able to accomplish this very difficult task. Attorney Manicioto began his career at Hupy and Abraham, S.C. in 2011, and is licensed to practice in Illinois and New Jersey.